The ongoing rage about the cop shooting of a thug trying to escape his strong-arm robbery of the Ferguson Market just 9 minutes before was just what the Controllers needed to happen somewhere in America at that time. It’s the time-old trick of turning lemons into lemonade which is easier to force down the throats of our present dummy-downed government school generation. 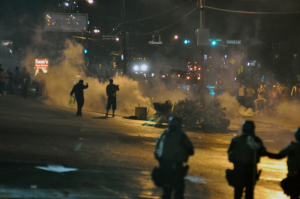 Let’s take a look at the Ferguson Smokescreen. A study of history will point out how “False Flag” and “Smokescreen Operations” have been used throughout history by bad guys to try and blindfold the populace. Like a good magic illusion, while the sheeple watch the scripted scenario, the Controllers are busy working behind the smokescreens doing something the people would raise hell about if done out in plain sight. In this case I think the powers-that-be outdid themselves. let’s review . . . In the beginning: Video shows that ‘gentle giant’ Michael Brown is in actuality a bully and strong-arm robber. This video was taken 9 minutes before his being shot and killed by a police officer. Video captured from two different angles released by the Ferguson Police Department from surveillance video that appear to show a confrontation at a convenience store. Police say Michael Brown allegedly participated in a strong armed robbery at the store. Go to stltoday.com to see complete coverage. So far we have learned that (A) Michael Brown and his homeboy Dorian Johnson strong-armed the owner of The Ferguson Market. (2) Nine minutes later Brown was shot and killed by police officer. A local incident that happens all the time in our inner cities. Then, Controllers Federal Po-lice stick their noses in. Why? This is a local punk taken out by the Po-lice minutes after he took what he wanted out of a convenience store, pushing the owner aside when he complained. The FEDS need to be spending their time doing Federal things not dealing with local low-life crime in middle America. However . . .
Oh, that’s right. White cop – young black man. Opportunity knocks for the Controllers and their pals. Just shut-up about the strong-arm robbery and insert the ‘race card’. Not only was this another chance to divide and conquer, it also came at great time! Obama was about to sign his “Executive Action” powers to insure that the 3rd world people from the south of us continue to come illegally by the thousands – millions. What better way to slip the immigration bill in while their controlled press and most of the sheeple are looking at a country wide race riot broadcast 24/7 by the controlled press. So, the controllers send out their best ‘race card’ dealers to fire up the populace . . .
A local punk, Michael Brown was shot after a strong arm robbery. But now its official. Because of the races of the principles in this case. . . . it’s a Race Crime! On August 19, protesters gathered in St. Louis following the police shooting of a 23-year-old man at a convenience store. The man’s death comes amid continuing protests in nearby Ferguson, Missouri in the aftermath of the death of 18-year-old Michael Brown, who was also killed by a police office. 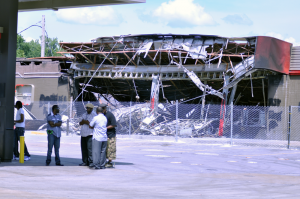 Image: A looted and burned gas station in Ferguson. Credit: Loavesofbread – Own work. Source: Wikipedia (CC BY-SA 4.0). To Jamie Edwards, a 13 year old student from Penwortham, England, setting the record of being the youngest person to build a nuclear fusion reactor was more important than video games or girls. That last part will probably change within a couple years, but his enthusiasm for science is very real and, for now, he’s a record holder. Of course, that also means he’s on the radar: Will he be a NASA scientist delving into the workings of the solar system or will he be kept under constant CIA surveillance lest his brain power fall under the control of some nefarious terrorist organization, like, say Disney World?